The actress might play video game designer Zoë Quinn in a film about Gamergate. In recent YES, QUEEN(S)! news, Scarlett Johansson might star in what is already an awesomely divisive property: a Gamergate film adapted from Zoë Quinn's upcoming memoir Crash Override: How to Save the Internet from Itself, to be produced by Amy Pascal and written by Rebecca Angelo and Lauren Schuker Blum. For those who missed the maelstrom in question, Gamergate transpired over the summer of 2014 as an online movement about ethics in video game journalism quickly unraveled into a full-fledged campaign to harass and threaten women in the video game industry. Johansson is currently in talks to play Quinn, the real-life video game designer/feminist badass who became the target of Gamergate supporters' vitriol after coming under fire for her provocative 2013 PC game Depression Quest, which takes an interactive approach to dealing with depression. 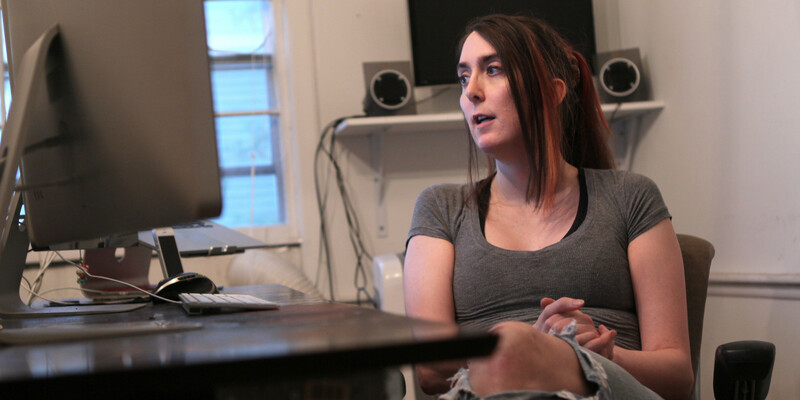 Gamergate was recently explored in Shannon Sun-Higginson's 2015 women-in-gaming documentary GTFO: Get the F&#% Out, which dissects the unseemly gender-based discrimination, among other social issues, that perniciously exists in the world of video games. But the movement — and Quinn's horrific experience, in particular — have yet to be dramatized, aside from the inevitable SVU episode, which is understandable since the events in question are barely a year old. It makes instant sense why Johansson and Pascal might have sparked to this material. Pascal's reign as Columbia Pictures co-chairperson came to an end after, according to her, she was "fired" as a result of the Sony Hacks controversy, as clear an act of sexist scapegoating as any in Hollywood history. And Johansson has dealt with her own share of involuntary public display, after the actress' private photographs were published online following an infamous 2011 cell phone hack. But Gamergate is also an issue that's ripe for cinematic treatment: real-life stories about sexual harassment notoriously run rampant in the film industry, but are rarely seen or tackled in the films themselves, which are frequently just misogynistic of their own volition. Additionally, the Gamergate backlash is still brutally fresh enough in the minds of many to make a trenchant film analysis of completely timely — and even necessary. I am, in all honesty, one of those people who has trouble remembering the last time he picked up a controller, but the repulsiveness of Gamergate remains well-known enough to still send a chill down my spine. It was an undeniable social media travesty that stretched far beyond any one single fanbase. Threats of death and sexual violence suddenly became the casual norm among many Gamergate-friendly web users, whose so-called "ethics" only ended up offending and genuinely endangering the subjects of their unduly intense aggression. Although Gamergate has been covered pretty extensively on the journalistic front by both gaming writers and a number of the victims (as well as John Oliver), a dismaying number of the video game developers and publishers who shape and control this 20 billion dollar industry have actually been supportive of this sickening crusade. In all fairness, the majority of the industry response sided against Gamergate, but the small groups that didn't (including actor Adam Baldwin) deserve to be taken for task for their idiocy and irresponsibility. Their all-around inability to safeguard or even defend woman gamers from their predominantly — but not exclusively — male players only continues to riddle the gaming landscape with hatred and prejudice, while nonetheless sullying it for those who truly love gaming and refuse to partake in such trollish conduct. A complicated culture this grotesque deserves to be pried open by filmmakers as eminent as Pascal and Johansson. The latter's highly-specific movie star persona as one of contemporary cinema's most daring, self-assured, and outspoken screen goddesses makes her a no-brainer choice for Quinn's embattled journey and, heaven knows, it would be pretty delicious to see Pascal take some sexist bullies to task. There is no more effective medium than politically-mobilized moviemaking to deliver these stories to a mass audience who will watch and respond to these violations and, in doing so, solidify this despicable behavior as public knowledge that is both embarrassingly documented and soon to be transferred into a studio-budgeted movie. These women must continue to tell their stories and on as many mediums as possible. A cinematic recreation of the Gamergate debacle — actually, even just a plan to mount a cinematic recreation of the Gamergate debacle — is an unquestionable gain for the opposition. It is a plain and unmistakable warning to Gamergate's embarrassingly dunderheaded champions that woman video gamers and their growing number of allies are prepared to fight back and that such detestable misogyny will no longer be tolerated — or taken quietly.